One of the major goals when creating your camp bed is comfort. Your bed at home generally has a box spring, but what can you use in a home-made camp bed? 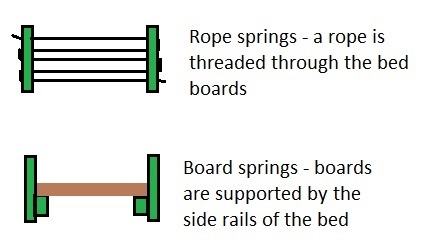 The most common camp bed solutions are rope springs and boards. Both are historically accurate and functional. The boards are heavier, but the ropes need to be re-tensioned every few days, take longer to assemble and are more likely to break. This graphic shows how both of these techniques work. The rope can actually be used as part of the structure of the bed – keeping the boards under tension, but this also means that a broken rope can mean a broken bed. If you maintain your ropes, watching for worn spots and making sure that the ropes are sturdy (no clothes line!) this should NOT be a problem. The boards are simply laid on supports on the side rails of the bed. Be sure that the boards fit fairly snugly between the side rails so that when they bend they do not slide off of the side rail supports. So how do we put the wooden pieces of the bed together? I have seen some amazingly complex and beautiful wooden beds – pegs, mortise and tenons, all sorts of creative and historically inspired furniture designs. I have to admit that when we made our bed it was put together with ¼ inch nuts and bolts. Why bolts? Simplicity, strength, and ease of construction. But more on that later… I should explain some of your options before I tell you how we do our beds. 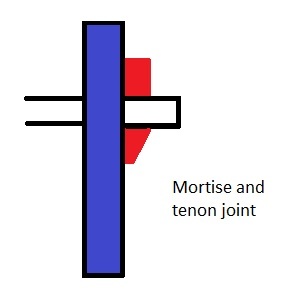 So what is a mortise and tenon? The blue represents the upright that has a hole, called a mortise, cut through it. The white piece that sticks through the mortise is called a tenon and the red piece is a peg which keeps the two pieces anchored firmly together. If properly constructed this is a very sturdy joint and was a major technique for joining wood together for centuries. It has the advantage of being able to be taken apart easily for transportation. 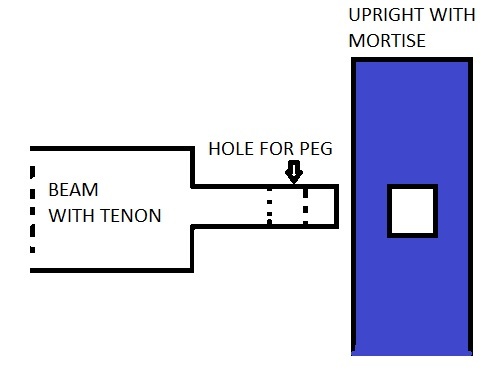 This next version of the graphic shows the details of the upright and the beam as they would appear in a bed. If you think about the fact that you are cutting a hole through a vertical piece of wood and putting another piece of wood through the hole, you should be able to see some of the issues. The quality of both pieces of wood must be good. The most critical piece is actually the tenon since that beam is greatly reduced in size in order to fit through the mortise AND a hole is cut through the beam to accept the peg. If the quality of this piece of wood is not good, it will break. The upright, while important, can easily be made heavier – and that piece of wood is in compression – which makes it much less likely to break. Lots to think about and figure out! Next time we will discuss the bed design that we have used for the past 15 years.